We rely on specialists and generalists on a daily basis. When remodeling a bathroom, a general contractor with some experience in carpentry, plumbing and electrical work is important to get the project planned. When it comes to the execution of each task (laying new tile, wiring vanity lights, installing new plumbing) it’s important to call in a specialist to get the job done right. Specialization is an important facet of the world we live in, but one that sometimes gets overlooked by investors. In this blog, we discuss generalists and specialists in the private equity market. Investment staff within large limited partners, including public pension funds, endowments, and foundations, often have to invest across several market segments. This commonly involves coverage of both the public and private markets. Regardless of each investor’s intelligence, it is nearly impossible for one person (or even a small team) to be an expert in the intricacies of each private market segment. 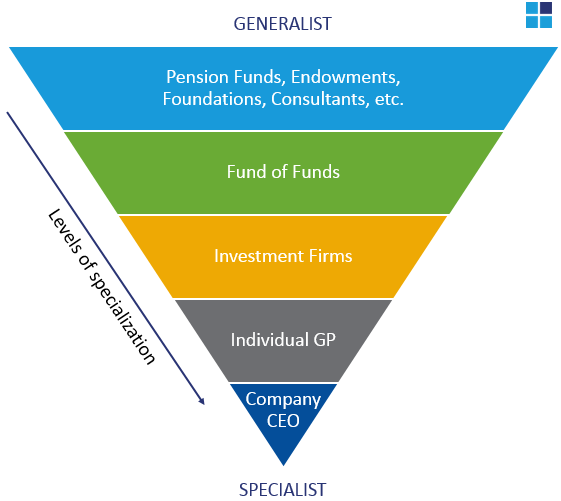 As a result, staff typically are generalists, but they invest in specialists in order obtain the exposure dictated by their asset allocation models. Each group increases in specialization from top to bottom of the chart. Pension funds, endowments, foundations and consultants are all generalists that have the responsibility of investing over multiple asset classes. It is the responsibility for these generalists to determine the best portfolio allocation for their plan, and then rely on the specialists within each asset class. Funds of funds are typically specialized in one asset class and as such they should have a higher level of skill in picking the teams and funds with a greater chance for outperformance. For example, Top Tier Capital Partners is a fund of funds focusing on venture. Investment firms are generally specialized within an asset class, and at times focus on a specific stage, sector, or geography. At the individual venture capitalist or company CEO level, those individuals are experts in their field and are typically highly specialized. However, we caution against funds being overly specialized such that they lose a broader perspective. Top Tier Capital Partners is a venture capital-focused investment firm, but we still spend time learning about trends in the broader private equity and public markets. These markets affect our industry, especially as they relate to exits of the venture capital-backed companies in our portfolios. To examine the level of specialization within our portfolio we looked at the 187 primary fund commitments made by Top Tier since 2001. 98% of the managers in our portfolio are ‘venture-only’ (the other 2% may be identified as venture growth, or special opportunities). Within our portfolios we rely on funds that are further specialized, and 88% of the funds are sector experts (i.e. security, enterprise, consumer), 82% are considered stage specialists (i.e. seed, series A, growth), and 73% specialize in stage and sector (i.e. seed-stage enterprise). 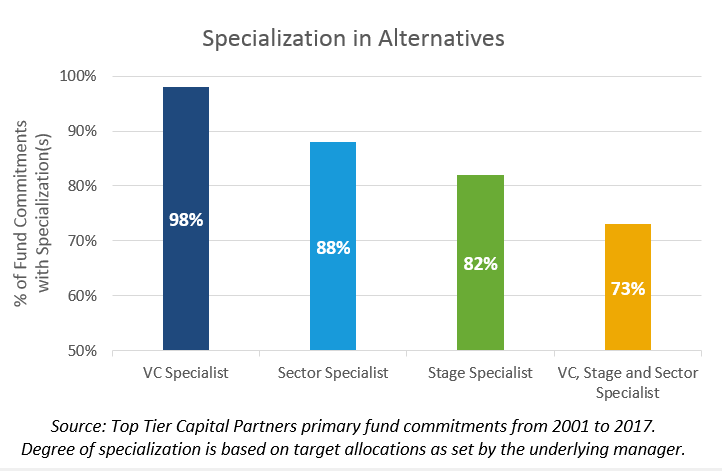 We believe specialization can be a key differentiator for fund managers. There is a place for both generalist and specialist funds, depending on the size and asset allocation model of the investor. We believe that as one gets closer to the actual investment, the more specialized the investor should be, but all investors should maintain a broad enough perspective so as to maintain realistic views. As a fund of funds we seek to invest in individuals and funds who are experts in their fields and recognize that we are paying for their expertise as specialists.